When it comes to how to improve yourself, it is great because you don’t have to go anywhere to do so. You can always create a better you right where you are. Wherever you are. Also when it comes to how to improve yourself, it also has to do with how to improve your self esteem as well. Because the two go hand in hand. The more you grow as a person, the higher your self esteem and self worth gets. The better you feel about yourself. And the better you treat and people treat you. Life gets better. Every part of it. But what are the best things for self growth? What are the most effective tactics and qualities? Well below I go into exactly that. 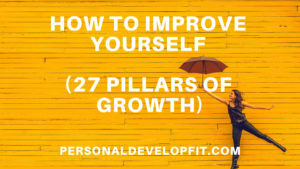 I created a guide of the pillars of self development and personal growth. That can set you on a path to knowing yourself better. And growing yourself beyond anything you ever thought possible. When it comes to improving yourself, you need to know yourself first. And to know yourself, you need to be completely honest with yourself. Otherwise you will never grow to your full potential. You will live life in passive denial. And no on reading this blog wants that, I know for damn sure! So in order to start the process of growing yourself, you need to realize what you need to get better at. If and when you are ready, create an honest list of what is getting in the way of using your time effectively. Throughout the day, note habits that are getting in the way of you reaching your full potential. Do this for a week or two. The same reoccurring bad habits will keep showing themselves. Now you can take one at at time and start doing things that replace that bad habit. Don’t try to tackle too many bad habits at a time. Even eliminating one bad habit from your daily life can drastically change your entire existence. For example if aren’t eating healthy, note the things that you do to support this habit. Say you eat bad because you don’t have time to cook. Well first off all we all have time to do the things we need to do. More than likely you and I are wasting time doing other things that we could be dedicating to doing other things. So instead, you can pre prep your meals for a few days in a row. So that you have healthy and nourishing meals in the refrigerator you can just warm up. Also look back on your past and see where you sabotaged yourself. What it was and why you did so. The past repeats itself if we don’t correct it. One of the best pieces of advice for growing myself that I ever came upon was from the book The Success Principles by Jack Canfield. He talks about how we can employ the help of other people that know and care about us the most. That can help our journey through self improvement. And it only consists of asking them ONE question. That is asking them “Where do you see me sabotaging myself?”. More often than not, the habits that we could benefit from changing are so ingrained in us. So deeply that we don’t even think about changing them because they are so part of us. But someone from the outside that really cares about us can tell us the truth. But the thing about this is that no one wants to be wrong. Or have something about them pointed out that isn’t necessarily good. So when asking people this question, make sure they know that they are safe to tell you ANYTHING. Create an environment for them that they feel comfortable sharing whatever. Because this could be your key to unlocking more potential in yourself. Always take it, and any criticism as feedback. It is just a way to better yourself. Not as a personal attack. Be open and simply thank the person for helping you on your growth journey. We measure everything in life. From the temperature outside to the amount of hits a batter gets. To the final score of a game and how much battery life we have left. We love measuring things. It lets us know if we are on or off course. As well as gives us motivation when we track and see our progress. As well as gives us indicators to change course when we need to. So when picking the areas of life you want to get better in, give yourself a score. No matter what the score is, ask yourself how you can make it a ten. Even if you are trying to create a better relationship with your spouse or kids. Ask them too how you can make your relationship with them a 10. This personal and interpersonal feedback will give you the ammo you need to hit your target more squarely. Ask this question often. Even daily on the way towards better yourself. If you have a goal of becoming better at time management, give yourself a current score. Then ask what you did that day that was good. And then the things that you are doing that are getting in the way of you rewarding yourself with a 10 score. If you have ever heard of the Hawthorne Effect, it supports my point here. It is where our behavior is modified when we are being observed. Well essentially we can induce the Hawthorne Effect on ourselves by observing ourselves. We will be more adapt to make better changes and do the things we do to support our goals at a more efficient and better rate. Jim Rohn talked about how we need to work as hard and even harder on ourselves than we do at our actual job. Because if we wan’t life to get better, WE need to get better. Once you realize this, you will see growing as something NECESSARY to do, not just a luxury. Internalize this deeply. Recognize the power of growth. That it can literally transform EVERY area of your life. Then seek improvement every single day of your life. Don’t try to do too much at first, especially if you are still in the beginning stages of starting your personal development journey. Doing to much at first will usually result in failure. Baby steps, then start walking, then start running. Schedule the time in your day for your growth. It can even be while doing things simultaneously. Like cleaning your car and listening to a good self improvement book on Audible. Or it could be right when you wake up or before you go to bed at night to create a good morning routine or night routine. Simply put it in your schedule. Let the benefits of personal development add up. And they will. They won’t seem very significant at first. The hours you put in. But they soon will. Your mental health and outlook will shift a will every other area of your life. Inevitably change for the better. The only way a habit is developed is by doing something every single day. And is very monotonous and simply not pretty. Big shifts in peoples life happen like this. A gold medalist is awarded in public for all the hours they put in in private. Behind the scenes is where transformation starts. Then it becomes evident to the world after doing so constantly, over and over and over. Until the shift and changes are permanent. Any growth you obtain on this journey is yours for good. You can’t lose it. This is why people who make millions, lose it, then make it again do so. They have created the type of personality and person to attract and create millions of dollars. The same thing is true about lottery winners. And people who attract sums of money when they are not ready to do so. The lose it all. They didn’t develop themselves enough attract or feel worthy of large sums of money. Q: How Can I Grow From This? Ask this question pertaining to anything you have done “wrong” in life. Or feel guilty about. How can you grow from it? What can you learn? What can you take away from it that is positive. Reframing your mind to seek growth in every opportunity allows you to see life as a school. Where you can constantly be learning and growing. It also keeps you looking towards the future. Instead of regretting the past. We all do things that we regret. But you can’t stay there. You need to move on. And you can by asking this question. Life is the best teacher if we will simply show up to school. This is the cardinal sin to doing anything worthwhile in your life. When it comes to growing yourself you are going to need to do things that you don’t want to do. Or simply don’t feel like doing. But at times where you feel like not doing something, you need to do so. Because you need to do things until you feel like it. Instead of waiting to feel like it. Simply getting the ball rolling is what creates momentum. Then momentum takes over and does more of the job for you. A NASA rocket relies on much of it’s fuel to get it into space. Then uses almost no more fuel as it can just coast it’s way towards it’s destination. The same thing can be true with us. Simply START no matter how you feel. This will also allow you to get out of your comfort zone. Which is where all growth takes place. On your personal development journey, or any journey for that matter, it is naturally to want to ARRIVE. To be at the destination NOW. It is partially due to how society has pretty ingrained FAST results in us. But nothing good has ever come from forcing the process faster along than it is mean to be. So fall in love with the journey. Embrace and look forward to the things in life on the journey. The daily thing you have to do. Even more so than looking forward to the destination. Don’t try to bypass the journey. Don’t skip over anything. This is the ultimate secret of getting to anywhere meaningful and getting anything substantial in life. To literally love the process more than you do what it will bring you. It is not what you get in life, it is who you become to get it as Tony Robbins says. Instead of thinking “when will this end?”. Think “How far can I go?”. You will get to this point sometime on your journey of pursuing growth. If you do so for long enough. This is when things get fun my friends. Before we take full on, 100 percent responsibility for our lives, we are stuck and trapped in victim mode. We can never move out of this mode if we feel that we are the victims. Or worse, play the victim. What victim hood does is keep us trapped in the same repetitive cycle. It keeps us stagnant. And what happens when things are stagnant? Nothing good. When you assume responsibility for everything that happens in your life, you take over. You take the rains and crack the whip on the horsepower of your life. You move out of being stagnant. And you move into creating more positivity in your life. That comes from being the pilot of your life. You will grow to the extent that you assume responsibility for your life. We can start to take responsibility for our lives by stop asking things like “why me”. Start thinking of ways you created the bad things in your life. Which will allow you to create and appreciate more of the good things in life. We cannot grow to our full potential or even at all if our environment is not conducive to supporting our growth. Just like when we plant a new plant, we want to make sure the soil is of great quality. The same thing is true when we want to plant ourselves and grow. No matter what type of environment you are in or come from, change is needed to maximize growth potential. For example if you are in a bad environment, you need to get out of it and get rid of the people around you. But even if you grew up in a good environment where your family embraced growth, you may have a negative connotation with moving forward with your own growth. Simply because it was instilled by people in your family. And we never listen to family! We always need to hear it from someone else. When the WHY is big enough, you can endure almost any how. Create a list of the top reasons you want to grow and become a better version of yourself. Some reasons could be that you want to reach your full potential. Or that you simply don’t want to waste life because it is precious. Or because you want a higher income or more fame and recognition. All of these things and more can come from growing as a person and developing yourself through self improvement. You just need big enough reasons to encourage you and inspire you to stick with it. Day in and day out. Create reasons that inspire you! Now this can be actual people in your environment if you can. Mentors, people who are higher up in you in your company, people that are in better shape and health than you. You always want to trying to surround yourself with better people. This is because if we are around people who are the same as us, we have no reason to want to grow. But if we have group of people where we are the weakest link so to say, we want to strive to become a stronger link in the chain. We have to if we want to give to the group as much as we take. It also keeps you out of your comfort zone. Which as I said above, is where most all of change and growth take place. Find a way to give back to these people as well so that they have a reason to include you in their circle. Life is give and take. Also, you can of course, hang out with authors, speakers and bloggers who are on another level than you. No one said this isn’t possible! You become who you hang out with. That is a fact. So why not surround yourself with some of the greatest people to ever live. By reading, listening and watching them and going to watch them at events? It is said that if you put a pumpkin in a jug and start to grow it, it won’t ever grow bigger than a jug. The same thing is true with our circle we our in. We can’t grow past the size of how much our circle is growing or seeking to grow. A social psychologist David McLellan of Harvard was referenced in the book “The 15 Invaluable Laws of Growth” By John Maxwell. He talked about how the people that we surround ourselves most with our called our “reference group”. These people and their presence in your life can contribute as much as 95 percent to your success or lack thereof in your life. It is essentially the belief that we become the average of our 5 friends. So make better friends! When we are talking, we simply do not learn anything. The more we listen, the more we can gain from others knowledge. Also the more we listen, the more we engage with people. We are able to create better relationships as well as expand our social and professional circles. Our whole life can get better simply by listening more than we talk. I wrote an article to help you on this! You can check it out here: How To Be A Good Listener. Being honest and open can make you feel vulnerable. But it takes the veil of denial off over our eyes. If we are always seeing the world through rose colored glasses, we never really learn the truth. Or want to see the truth. Success in life is seeing how things really are. Which starts with being honest with ourselves. And then being real with people by being honest with them. It builds a feeling of integrity in yourself. That you aren’t trying to be anything you aren’t. It creates a world where you act upon real life. Instead of being blinded by things we don’t want to be honest with ourselves about. It is like the person who doesn’t want to see that their relationship is falling apart. They ignore internal signs. As well as external signs like people even telling them that they need to leave their significant others. It drags along for years until it ends badly. But if they could have been honest with themselves, they could have left the relationship. Been single for a while and focus on themselves. Then attract a much better person into their life. You can also ask for help from others that love you. Ask them where you are simply not seeing the truth. Of where you may be resisting change. Often times our growth can be stifled when we simply want to master everything. Or make sure everything is perfect until we act. Don’t want for everything to be perfect. Fail forward. Plain and simple. You are going to mess up. You are going to scrape your knees up a bit. The world will tell you no over and over. But keep moving forward. Keep improving. And don’t give up. Often times we will tell ourselves we can’t be something because of who we were in the past. Maybe we were not a good worker, but want to become one. But since we may have slacked off in the past, we think we can never become a good worker. People can change, including you my friend. The past doesn’t have to reflect your present or future. Make a decision to change and then do so. Don’t let your negative self talk get in the way of changing and becoming the person you want to and even are meant to be and become. In order to grow as a person, we need to never let our failures and setbacks define us. We need to acknowledge them and then work our way through them. Only let your failures define you by overcoming your failures. Inspire yourself by tackling any obstacle and setback. To where you get to a point in your life where you know that you can obliterate any obstacle. Become so adept at conquering your obstacles that you know you can move any mountain put in your way. And like a hiker climbing any mountain, becoming physically and mentally stronger when you reach the top. Embrace the power of perseverance and keep moving in the right direction, which is forward. Don’t wallow in failures or sorrow for to long. Lick your wounds. Get up. And move forward with a vengeance. We often times can get in the habit of giving just enough. Just enough to get by. Just enough to get paid. Just enough in our relationships to keep them afloat. But it breeds a sense of mediocrity and living among the status quo. Average. There is nothing good about average. You get average employment, average relationships and average income. An average life. But if you want to grow yourself, always make it a point to give more than what is demanded. Give more that what it takes to just get by. You will grow from creating more fulfilling and provoking relationships. Your income and job opportunities will grow because you will get advanced for your efforts. Or the right people will see your extra effort and offer you new employment. And because of this, your income will rise. Giving the extra effort also puts you on the journey to self mastery. Which is where massive shifts in growth take place. When it comes down to it, we can easily reflect on the bad things on our life after we went through them. With a more positive attitude and optimistic reflection. But in order to really grow as a person, you and I need to be positive THROUGH negative situations. This is the hardest thing to do, but offers excellent rewards. If we learn to be positive through negative situations, we can grow through them. Instead of just trying to get through them as unharmed as possible. We instead seek to take it on the chin. Get cut and bruised up. To embrace pain because it will create a way more tough exterior. An exterior so tough that it brings that confidence that you can get through anything in life. There is no true growth without pain. But we can get the most out of our pain if we grow through it. And we don’t try to deny it. Face it head on. Often times the bad things that happen in our life can put us face to face with the changes we need to make in order to create a better existence. So be present during your pain, as hard as it can be. Pain is a great teacher if we will allow it to teach us. It can tell us that we are on the wrong road and provoke us to turn around. A road that we may have kept going down if we simply didn’t hit the fork in the road. Fight instead of flight. What Is The Best Time To Grow For You? Often times we can do things that put us on the path to growth. But we do so at times that are simply not conducive to the best times WE learn. When do YOU learn best? Mornings, evenings, in the car, at seminars or through books? What time and what vice gives you the best and biggest leaps in your growth? Figure out the best time for you to grow and set in on your schedule to do so daily. They aren’t called LIMITING for nothing! Limiting beliefs keep us stuck in victim mode. And it also keeps us on the mouse wheel. Of reliving the same life and being the same person every single day or our lives. It doesn’t offer us the opportunity for transformation. It doesn’t foster an environment good enough to grow from. It keeps us small. But keeps us safe. There is safety in doing the same thing day in and day out. There a feeling of safety thinking the same thoughts and holding the same beliefs day in and day out. But once we decide that we want to change, we can do so the fastest way ever, but starting with our minds. Since the world we create is first created in our minds, we can see drastic shifts when we start changing our minds. Limiting beliefs are a lot like weeds. The keep the garden from growing to it’s full potential. And limitless beliefs are a lot like flowers. The more they grow, the more beautiful the terrain becomes. We need to rid ourselves of limiting beliefs that were instilled by people in our lives. And even more so, the ones we CHOOSE to take on. We need to take full responsibility for them because they are in OUR mind. Not anyone else’s mind. This is the first step to getting rid of limiting beliefs. Then it starts with monitoring our self talk relentlessly until we can catch ourselves thinking in the negative and then we can take the step to creating more positive beliefs and thoughts in those moments. Time management is a huge and crucial component of reaching your full potential. When it comes to growing as a person, you can maximize your efforts by asking yourself: What is the best use of my time right now? Only you can answer that question. But it is a question that can reveal to you what is most important. Instead of just reacting to life, you create a schedule for it. A schedule filled with tasks and things to do that are going to move you forward swiftly and in a an efficient manner. It will also allow you to say NO more often. Which will allow you to say YES to more things that are good for you and your goals and dreams. When it comes down to our journey of growth, everyone is different. What works for one won’t work for another. So when it comes to your growth, try things on for size. See if they fit and most of all feel right for you. Just because it worked for one doesn’t mean it will work for all. The general rule is to do things for 3 weeks at a time. This is enough time to start forming a good habit. If it doesn’t feel right after 3 weeks or simply doesn’t resonate, try something else. What are the things in life you did yesterday, last week, last month and last year that you did RIGHT. And of course what are the things you did wrong? We can all learn and grow from our track record. And again history repeats itself if we allow it. But we can repeat the good things over and over by reflecting on what they are. And then avoid the things that didn’t work good for us. Always building on our days, weeks, months and years. Until we put together a pretty damn good life for ourselves. Which can turn into a great and wonderful legacy. The more you do this with the bad things in life, the more you will grow from them. And better yet the less likely you are going to repeat the same mistakes. Human beings have a need for certainty. We love it so much because allows us to feel safe. To keep us in our comfort zone. To do things the way we do them everyday and get by with as little change as possible. And then do the same thing again the next day. But when we embrace and even induce change, we start to grow as people. The more we grow the more we are able to become stronger. You want to look at your growth as a life time pursuit. Always seeking to become more. And getting excited for how much potential you have and how close to reaching all of it that you can get. It is like an oak tree that sets it’s roots and grows massively. Surviving and thriving for decades or even centuries. And produces not only life for itself, but life and living environments for others. Not only will you create a beautiful and strong life for yourself by growing daily and for the long term. But you will also influence and affect others lives for the positive simply by taking a long term approach to your growth. Often times we do things in life more for the financial return instead of doing so because it is our gift. Which is totally cool and I understand this. We all have bills to pay, mouths to feed and people relying on us. But figure out a way that you able to devote just a small amount of time per day to working on your gifts. The things that when you do them give you life and hope. That you get lost in. If we do this on a daily basis, we create a soul growth. It is a different feeling that when we do so consistently, our who perspective on life changes. We become happy and better functioning humans. It allows us to exert a level of mastery over something. Which makes us feel self confident and more sure about ourselves. Which permeates in to every other aspect of our lives. What are the things that matter most to you? What attributes do you want people to know you by and recognize you by? How do you want to be remembered? Creating a list of core values, anywhere between 5-10 can help you really hone in on what you want out of life. And then you create days that align with these core values and principles. You obey them by creating a daily schedule that is in line with what you value. Simple but powerful. It is like having a ship with an itinerary. You can have the greatest ship in the world, but with a compass or any directions, you will just drift around. Core values can be things you already believe to be valuable to you. Or they can be things that you want to create in your life. Things that you believe will add more value to your life. And make you a valuable person. For example if you want health as a core value but have neglected it in the past, you can still have that as your core value. It creates a sense of accountability for you. These are the things you stand for and you are willing to sacrifice in order to stay aligned with them. Once they are ingrained in your personality and who you think and believe you are, they become part of your life. They go from habits, to internal core values that are unshakeable in your belief of them and your ability to integrate them daily. The harm we are talking about here is harm in the emotional sense. The kind that we inflict upon ourselves by simply reacting to these people in our lives. But the thing about it is that these people can be our biggest blessings and greatest teachers. They can reveal to us what we need to work on. The things, feelings, thoughts and emotions we need to let go of. They can reveal to us the inner workings of our world. The things affecting us from living in a happier, confident and more productive life. For example if someone makes you mad because they always have a big ego. Well maybe you do to, that is why it pisses you off. So it can help you tame your ego by showing you that you do similar things as this person. Then going about doing things to lessen your ego. Like meditation, praying and practicing acts like volunteering that take the awareness off of yourself. So there you are my friends. A guide on how to grow yourself. A guide to constant and never ending improvement. Something you can use as a guide to developing yourself to a point where you are on the path to self mastery. The path to reaching your full potential. I hope you enjoyed the article. I would love to hear what value you got from it. What your favorite tip or tips were and if you have any good tips to add about self growth! Lets chat in the comment section below.